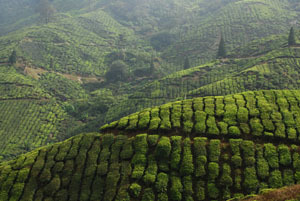 A city in western Bengal, India, Darjeeling is known worldwide for its tea. Its temperate climate makes it a pleasant place to visit, even at an altitude of over two thousand metres! Darjeeling has a population of around 80,000. It has a number of remarkable sites worth visiting such as the Botanical gardens with a wide variety of plants and trees from the Himalayan area, the Institute of Himalayan Alpinism with its fascinating museum collection of items previously belonging to famous climbers, and the Zoological Park housing protected snow leopards and red pandas both of which are endangered species. There are also a number of Buddhist monasteries, the railway with the highest train station in the world, and Chowrasta Place with its peaceful and relaxing Mall promenade. From the city you can reach various interesting places including Dhirdham Temple with its unusual architecture, Senchal Lake in the heart of the mountains and Tiger Hill from which you can see the unforgettable sunrise over Mount Kanchenjunga, not forgetting of course a visit to the tea plantations. Darjeeling is renowned for the kind and warm welcome of its residents although the night life is vivacious.